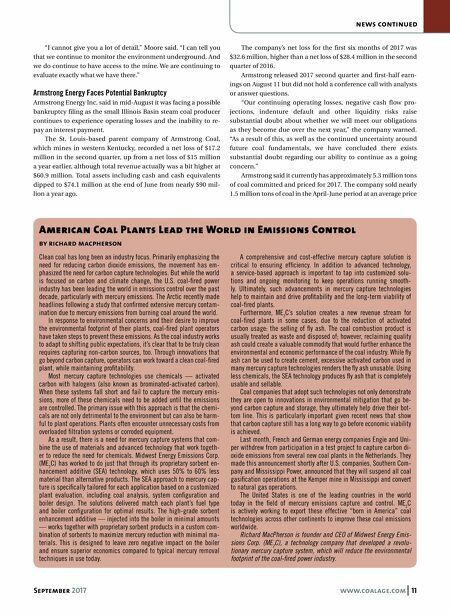 10 www.coalage.com September 2017 news continued "We, the utilities and railroads need to come together to have a win-win-win solution," he said, to better sync production with demand and transportation. "I'm hopeful that will happen. I'm not worried about it, but there's some opportunity for disruption if we don't come together." New Knight Hawk Portal is Complete at Prairie Eagle Mine Knight Hawk Coal LLC in late summer applied the finishing touches to a new portal at its flagship Prairie Eagle underground steam coal mine near Pinckneyville in Perry County, Illinois, and soon expects to reap the benefit of higher production from what essentially amounts to a new mine. 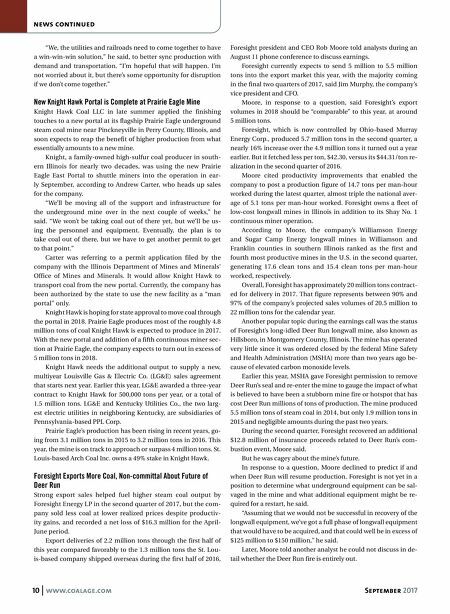 Knight, a family-owned high-sulfur coal producer in south- ern Illinois for nearly two decades, was using the new Prairie Eagle East Portal to shuttle miners into the operation in ear- ly September, according to Andrew Carter, who heads up sales for the company. "We'll be moving all of the support and infrastructure for the underground mine over in the next couple of weeks," he said. "We won't be taking coal out of there yet, but we'll be us- ing the personnel and equipment. Eventually, the plan is to take coal out of there, but we have to get another permit to get to that point." Carter was referring to a permit application filed by the company with the Illinois Department of Mines and Minerals' Office of Mines and Minerals. It would allow Knight Hawk to transport coal from the new portal. Currently, the company has been authorized by the state to use the new facility as a "man portal" only. Knight Hawk is hoping for state approval to move coal through the portal in 2018. Prairie Eagle produces most of the roughly 4.8 million tons of coal Knight Hawk is expected to produce in 2017. With the new portal and addition of a fifth continuous miner sec- tion at Prairie Eagle, the company expects to turn out in excess of 5 million tons in 2018. Knight Hawk needs the additional output to supply a new, multiyear Louisville Gas & Electric Co. (LG&E) sales agreement that starts next year. Earlier this year, LG&E awarded a three-year contract to Knight Hawk for 500,000 tons per year, or a total of 1.5 million tons. LG&E and Kentucky Utilities Co., the two larg- est electric utilities in neighboring Kentucky, are subsidiaries of Pennsylvania-based PPL Corp. Prairie Eagle's production has been rising in recent years, go- ing from 3.1 million tons in 2015 to 3.2 million tons in 2016. This year, the mine is on track to approach or surpass 4 million tons. St. Louis-based Arch Coal Inc. owns a 49% stake in Knight Hawk. Foresight Exports More Coal, Non-committal About Future of Deer Run Strong export sales helped fuel higher steam coal output by Foresight Energy LP in the second quarter of 2017, but the com- pany sold less coal at lower realized prices despite productiv- ity gains, and recorded a net loss of $16.3 million for the April- June period. Export deliveries of 2.2 million tons through the first half of this year compared favorably to the 1.3 million tons the St. Lou- is-based company shipped overseas during the first half of 2016, Foresight president and CEO Rob Moore told analysts during an August 11 phone conference to discuss earnings. Foresight currently expects to send 5 million to 5.5 million tons into the export market this year, with the majority coming in the final two quarters of 2017, said Jim Murphy, the company's vice president and CFO. Moore, in response to a question, said Foresight's export volumes in 2018 should be "comparable" to this year, at around 5 million tons. Foresight, which is now controlled by Ohio-based Murray Energy Corp., produced 5.7 million tons in the second quarter, a nearly 16% increase over the 4.9 million tons it turned out a year earlier. But it fetched less per ton, $42.30, versus its $44.31/ton re- alization in the second quarter of 2016. Moore cited productivity improvements that enabled the company to post a production figure of 14.7 tons per man-hour worked during the latest quarter, almost triple the national aver- age of 5.1 tons per man-hour worked. Foresight owns a fleet of low-cost longwall mines in Illinois in addition to its Shay No. 1 continuous miner operation. According to Moore, the company's Williamson Energy and Sugar Camp Energy longwall mines in Williamson and Franklin counties in southern Illinois ranked as the first and fourth most productive mines in the U.S. in the second quarter, generating 17.6 clean tons and 15.4 clean tons per man-hour worked, respectively. Overall, Foresight has approximately 20 million tons contract- ed for delivery in 2017. That figure represents between 90% and 97% of the company's projected sales volumes of 20.5 million to 22 million tons for the calendar year. Another popular topic during the earnings call was the status of Foresight's long-idled Deer Run longwall mine, also known as Hillsboro, in Montgomery County, Illinois. The mine has operated very little since it was ordered closed by the federal Mine Safety and Health Administration (MSHA) more than two years ago be- cause of elevated carbon monoxide levels. Earlier this year, MSHA gave Foresight permission to remove Deer Run's seal and re-enter the mine to gauge the impact of what is believed to have been a stubborn mine fire or hotspot that has cost Deer Run millions of tons of production. The mine produced 5.5 million tons of steam coal in 2014, but only 1.9 million tons in 2015 and negligible amounts during the past two years. During the second quarter, Foresight recovered an additional $12.8 million of insurance proceeds related to Deer Run's com- bustion event, Moore said. But he was cagey about the mine's future. In response to a question, Moore declined to predict if and when Deer Run will resume production. Foresight is not yet in a position to determine what underground equipment can be sal- vaged in the mine and what additional equipment might be re- quired for a restart, he said. "Assuming that we would not be successful in recovery of the longwall equipment, we've got a full phase of longwall equipment that would have to be acquired, and that could well be in excess of $125 million to $150 million," he said. Later, Moore told another analyst he could not discuss in de- tail whether the Deer Run fire is entirely out.